The day was made possible through Junior Achievement of Greater Washington's partnership with the Washington Redskins Charitable Foundation. 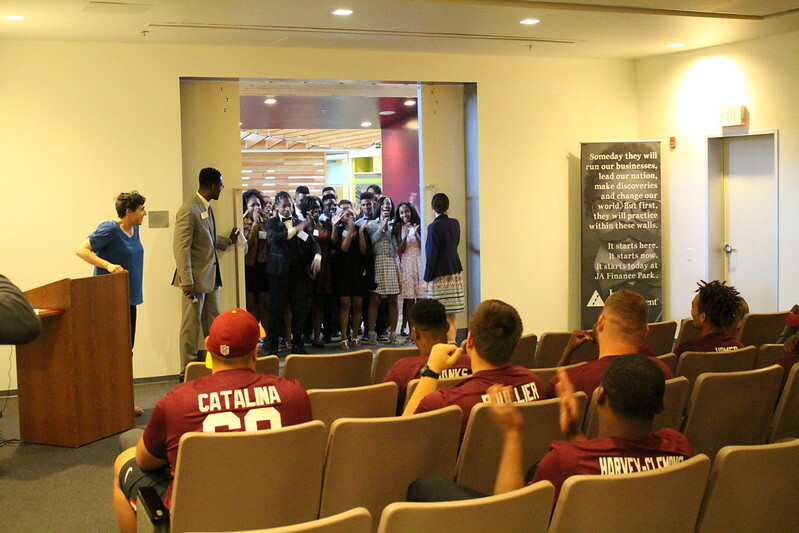 While more than 9,000 Prince George’s County Public Schools students go through the financial management program each year, the Redskins rookies and Pullen Middle School students utilized a modified version of the program for a crash course in financial literacy. Roles were reversed as student graduates of the program became teachers, and paired up with rookies to help them navigate through different scenarios based on a unique career, salary and life situation. The groups started with laying out a monthly budget before tackling required payments and shopping needs. Junior Achievement is grateful for this partnership that not only allows the rookies class to reinforce good money habits, but also allows for the students to expand their leadership skills and experience the simulation from a different point of view.